Remember Evenson? Click here to read the blog post with his story. Well he is HOME! After being in the states for a year...he is back in the arms of his parents. Look at the smile on this Mama's face! I love it! Her son who was on the path to an early death when she last saw him is now back in her arms cancer free! God is good...He provided top notch medical care 100% free of charge to this boy born into a family who could never pay for it. What was impossible for his earthly parents to do for Evenson was made completely possible by his heavenly Father. What an amazing example of God's provision Evenson is. Evenson went to the states under the mission Angel Missions Haiti. 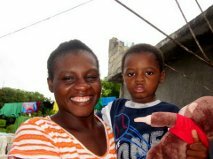 Click here to be directed to their website to see how you can help other kids like Evenson receive the life saving care they need. I worked for this mission for a year and I can not say enough positive things about them. 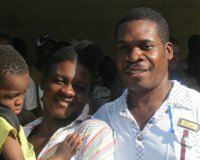 God is using them to make a difference in kids lives throughout Haiti.